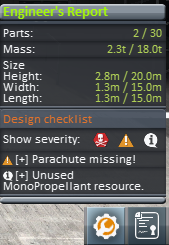 The engineer's report is a feature added in version 1.0 that prevents potential errors on the craft. It appears on the bottom-right toolbar in the SPH or VAB. It looks for and reports common errors, such as forgotten parachutes, legs, wheels, landing gear, or batteries, no control, or engines without fuel.